The story of Premium Travel begins with 2 young ladies working for a tiny start-up inbound tour operator 14 years ago. In the coming few years they’d work very very hard and the tiny company’d expand, and later they’d be joined by 3 other young ladies. Then altogether as a team they selflessly devoted themselves for creating one of the biggest names in Mongolian tourism. In April 2015 the big company went under a management change, and the 5 ladies decided to start their own company that would reflect their philosphies and desires. And here we are at your service! From our previous experiences in different roles at all levels in tourism, we have learned that the quality of service is solely based on dedication, communication, proficiency, and trust – that is built among all stakeholders. Therefore, we are indeed attentive to our responsibility and roles in creating a wonderful tour experience for you. 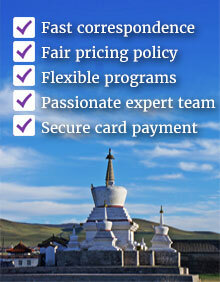 We at Premium Travel are proud of our prestige in the local and worldwide tourism community. Crystal has a childhood dream of travelling the world and inspired by her dream she joined tourism industry in 2010. She designs excellent tour programs for her clients with a great passion and motivation as a dedicated lady. Born and grew up in the remote western Mongolia, Crystal loves going outdoors, biking and photography. Zola loves travelling and exploring new cultures as she believes “travelling is to live”. An Oxford School of Hospitality Management alumna, Zola directs the company’s marketing and handles foreign relations. She joined tourism industry in 2003, and her dream is to contribute to the development of sustainable tourism in Mongolia. Tunga has started working in travel & hospitality as the General Manager at one of Mongolia’s best resorts in 2007. Her willingness to fulfill her clients’ needs lead her to become a top manager in her field. 1 year after giving birth to a lovely son, Tunga happily joined her team and now takes care of Premium Travel’s tour reservations fully. Nyama is an adventurer and a tough native of the Gobi, who started her career in tourism after completing several Raleigh International ventures successfully in 2001. As an MIB graduate and a happy mum of one Nyama oversees the company management, and enjoys biking and hiking in wilderness whenever she has some free time. Premium World Travel: specialise in outbound travel for both business and leisure travellers, and arrange services such as visa, air ticketing, hotel booking and ground activities arrangements.